You can find the slides in here. Short posts: Time to go back to blogging? After 8 years writing short messages on Twitter, I’ve noticed something. It’s not a sudden observation, but rather an accumulation of these years. Maybe what I’m noticing is tiredness. I love Twitter to share information, and with Reddit and other websites these are my link sources; I like also to share back what I read. However, I see that it’s tiring to use Twitter to discuss and create a community. I’ve always compared my timeline (that comprises more than 2000 accounts) as trying to drink from a fire hose. It’s not in my interest to have a carefully curated timeline, but rather a fountain of serendipity. But this goes against talking to, you know, real people. I usually encourage anyone, with whom I don’t have a previous relationship and that writes me through a DM or a Facebook chat, to write me to my email (ciro.duran@gmail.com, just so you know). Email as a way to communicate that I can read when I want, with no notifications, with the length I want, and with no restrictions beyond my available time, is still for me the best way to communicate between peers (group conversations are another subject, much more complex). I like to read your email, and I like to answer you, though I confess that sometimes I don’t do it, rather because of distractions (and real life priorities) than because of malice. On the other hand, Twitter restrictions impede expressing about things that are larger than an SMS. This already happened when we moved from SMSs to mobile instant messaging (i.e. iMessage or Whatsapp). But the perspective of Twitter increasing their limits to 10k characters is ridiculous to me; it’s a huge bait and switch, and Twitter passed that no return point a long time ago. It would change its nature to something completely new, and I’m not sure I’d like it. I like to keep my writings as mine. If I write on Twitter or in Facebook is because I value more being able to communicate to other people rather than keeping what I write. But companies rise and fall, as it has happened before (e.g. Geocities). And what you write might be in danger of going away with the company. With that in mind, I prefer to make myself responsible of taking care of my writings and have the capacity to copy them and store them where I want to, with data formats that make it easy, and not hidden inside some configuration screen. Having said this, I’d like to store my impressions in a much more trustworthy place. And then figure out how to communicate it to other people. This is the first writing. David Bowie died this past Monday 11th of January. It was very sudden, unexpected, as he had released a new record days before, and also he had his birthday just as recently. I also happen to live in South London, not too far from Bowie’s birthplace, Brixton. I’ve been there a couple of times. It’s a really ethnically diverse place, next to Central London, great food, and markets where to buy plantains, one of my favourite foods I used to eat in Venezuela, for cheap. I personally have not listened to more than three or four songs from Bowie, but I thought it was a unique opportunity to see history in the making. To see part of something bigger than anyone. Gathering around to celebrate a man that had just become his songs. A man that now will live in the guitars and musical instruments of all those who play him. That’s his level of influence. I got down in Brixton railway station and the first thing I did was to look for something for dinner. Meanwhile, I began to think what the hell was I doing there. I had only learned of Bowie’s birthplace two hours before. I had no idea where to go or what to do. So I looked on Twitter to see what was happening around. I found out about Bowie’s mural next to Morleys Department Store, and the Ritzy Cinema, which had put a big sign honouring Bowie. So I went to the mural, which was nearest, to see what people were doing, It was surreal. 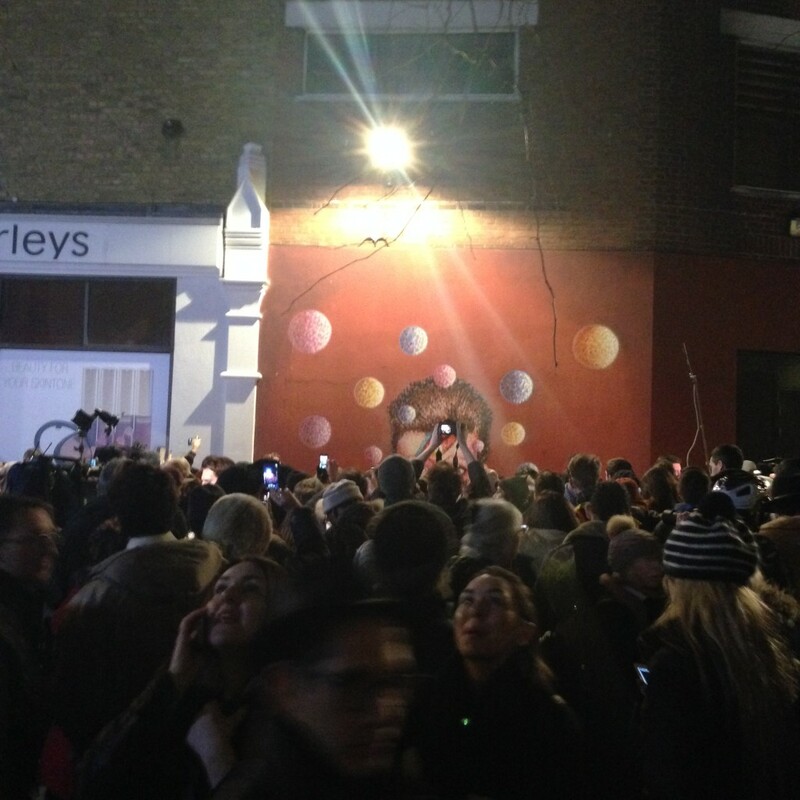 There was a big crowd around the mural, with lots of people raising their hands with their phones, probably attempting to capture the mural and the front row of people putting flowers. But from my point of view, it was just half of the mural, with lots of little screens around. Were they trying to capture just the lower half of the mural? 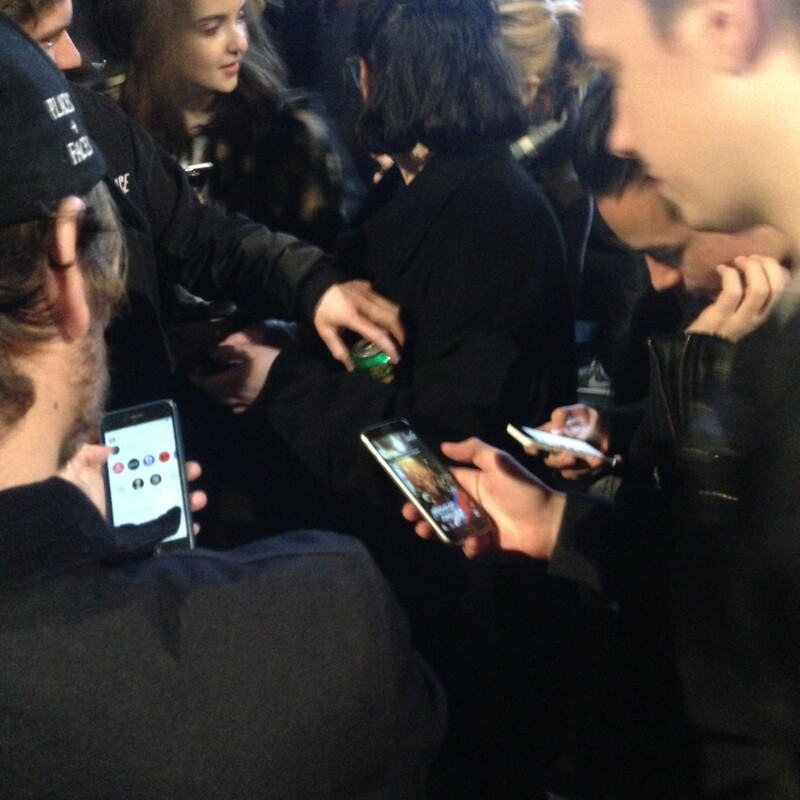 The heads and phones of all the people piled up there, like I was? Some people were really happy showing off their pictures between their groups. There was another big crowd nearby. The crowd was not gathered around anything in particular, and after they left there was nothing, just an empty seat. I could hardly listen to a guitar playing, but that was enough for people to sing Bowie’s songs spontaneously. Some people went as groups, but in general, no one knew each other, except that they were there out of their love for David Bowie. My wife and a friend joined me right after, and I showed them the place I had arrived just 10 minutes before. I considered all of this like a theme park that was in development, with attractions that come and go. You were an attraction if you brought your musical instrument, or came dressed as your favorite Bowie era. And very soon, all these places will become shrines to come and feel a connection with the artist. Not long after we were standing there some guy comes next to us and asks us what do we think about John Lennon. He said it in a very convincing voice, as he was really attending John Lennon’s memorial. After a very awkward minute, he started laughing and began to tell us his story. He started listening to Bowie when he was fifteen, that it had touched his heart, that John Lennon, Roger Waters, and David Bowie were his favourite musicians. That England had so much good music to show up. That it was the musicians the soul and the face of the country, not the politicians. It was these guys that really communicated the values of our society, and that that made him very, very proud of being an Englishman. In London’s everyday, it’s very rare that someone will come out of the blue and pour their heart on to strangers, but right there, right now, it was the correct moment. Before he left us he jokingly invited us to his place to eat. Probably our face was a clear sign of declining his invitation. Nevertheless, I asked him his name before he left. “Amon”, he said. He said he was really Irish, but that he had been living many years around London. We continued walking to the nearby square in Brixton. 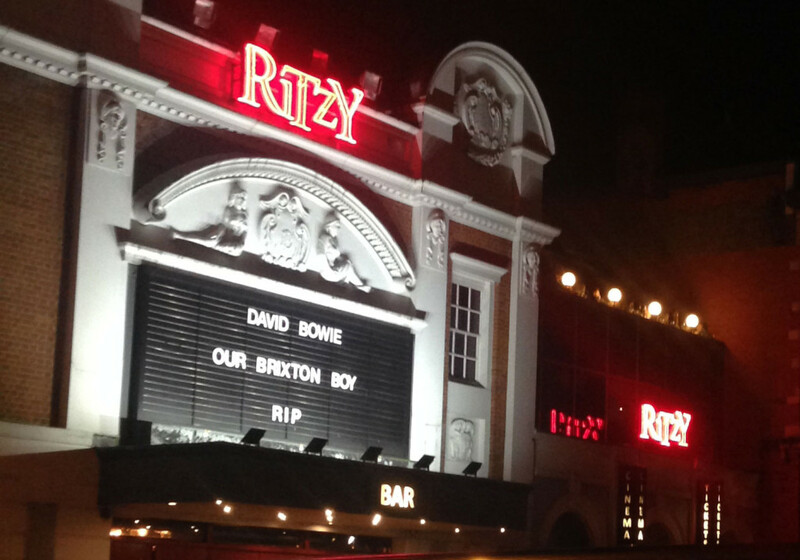 The Ritzy Cinema had a huge sign honouring Bowie, and the square in front was full of people. Young and old. Everyone remembering him and his songs. Some with musical instruments, and others with speakers that were too weak for the vast public space around. But the weakness of the speakers was aided by the people around, who started chanting the songs and thus everyone that was a bit farther started singing. The center of the square was particularly packed with people. I could not what everyone was gathering around there. But I could see that a building next to the square had all their lights on, with people next to their window celebrating the musician as well. One of the windows had a projector showing mute music videos. 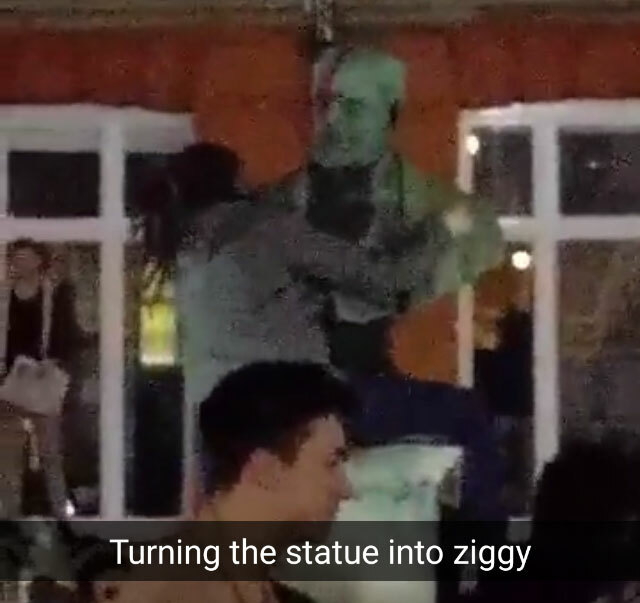 There was a bust that suddenly fell into the attention of everyone, as one guy hopped into the bust, embracing his legs around it, and started putting some masked tape to the face of the bust. After putting the tape, it was obvious what was going to happen next, with a fucsia spray one part of the eye and the forehead was now painted with a thunder in Ziggy Stardust’s fashion. This was it, there was no other objective in this gathering, more than to share the feeling of having enjoyed his music, celebrate it, and be happy for it. It was not a mourning, it was a reaffirmation of what he represented and the legacy that he left. I finally uploaded here Blame Clotilde!, a game made in past August together with Héctor Vargas, ¡it was a great experience! I also seized the moment to upload several game I’ve done throughout several game jams, so they now have their own place. I was leaving my worktown very late as I was with some friends after work. Thus, there were no longer any direct trains to my home, so I had to take one that passed through Gatwick Airport and then connect somewhere in London. I was ready for the long trip, so I was leisurely reading a book while hearing music. I noticed some guy barely able to stand, right next to me, speaking loudly on his mobile; I wasn’t able to know what he was talking about as my music drowned his words. He eventually sits in the opposite of the table I was sitting in. It was probably that the battery of his phone died, or hanged up, but he shut up and then started looking who to talk to. It was not difficult task as I was almost the only one in the coach. The guy had a black cap, weared backwards, showing a very stylised figure of an Egyptian Sphinx. He also wore some huge pilot sunglasses that covered his eyes, and had a plastic bottle that used to contain water, and now contained some yellow alcoholic beverage that might as well be used for de-clogging sinks. “What are you reading?”, he asked. At first I did not pay attention, as it is usually a tacit rule that someone with earphones wishes not to be disturbed, unless it’s a train guard asking for tickets. But since this guy was clearly so drunk, I guessed he was not much into etiquette. So I started listening to this guy, who immediately switched to how happy he was. He had just left a girlfriend who worked in Gatwick Airport. He had two girlfriends, he told me. This one, and a correctional officer, who he met when he got out of jail. He had one baby with each one. He was particularly happy because he felt his future was assured by the jobs of one of these girls. He asked me what I did for a living. I usually do not reveal immediately I make games for a living to strangers. So I answered that I worked with computers. He started a whole speech on how he has worked with computers and how he has assembled and disassembled them. I was then a bit more specific, and revealed that I worked developing software. He then asked in what sense what I did improved his life. It’s actually a good question, regardless I develop games or not. I seriously doubted this guy had a bank account, so I couldn’t appeal to that, but even then, if you think about it, being shut out of modern finances is in no small part an influence from computers and what me and other programmers do. I gave a really clunky answer I couldn’t remember. The final subject we touched was the latest money-making scheme he was devising. He asked me how much money per weight a fish costed in the High Street. To be honest, I did not understand to which fish he was referring to, as my vocabulary in English for fish is quite limited. I took my earnest intention to guess, and said between 5 and 10 pounds. He said it was about 7.5 pound, and claimed that for that price he could sell as much as four times the amount of fish. So his plan was to buy fish from the Peckham market, and he also mentioned Hoxton as an alternative. Also buy one or two refrigerated vans, and distribute fish around the south of London. The only thing he needed to do was to have a laptop at his home where he would run the company. I asked him who could he hire to drive the vans, as this person would need to be trusted to drive well, or at least not to take the van away. He disregarded that as an important issue, he said he would just hire an uncle, or a relative that could take care of that. He surely seemed really confident and happy about this plan. As I got to the station I would change trains, I said goodbye, got my stuff, and asked him before I left the train what was his name. “Craig”, he said. So I said bye to Craig, and wished him good luck in his endeavour. And then all trains to my home in the next hour were cancelled and I had to take a bus in the end, but that’s another issue. I have something important to say today. I believe it is important to share it with all the followers of my work. I accepted an offer to study a Master in computer games programming at the United Kingdom, with a year of duration. As you’re reading this text, we will have travelled and I will have started the course. I’m studying this course at Goldsmiths College, a university that has a long tradition in arts, something that attracts me a great deal. Although, the master itself is strongly oriented to programming. One of the teachers of the course has worked for over 30 years in the field, and in its most recent curriculum works with the compilers in Sony. These last months have been for me a terrible pressure. Emigrating is not only a test that consists in completing all requisites and you’re done. It is a psychological test that strains your spirit and those of who surround you. Thank you, thank you, really, to all the family and friends that have supported us in this tough process. The moment the thinking of leaving to somewhere unknown settles in your mind, that solid floor you sed to have disappears, and you enter in a freefall: what you knew stops making sense, and you must complete a series of sequencial steps so your life can continue. And in the meantime these steps are completed you must wait, and that threatens your mental health. I do still think that Venezuela has an impressive talent in matters of videogame development. Moreover, I think it develops despite the things that happen around that affect or minimize their importance. As you know, the Caracas Game Jam 2014 will be done and will be bigger than 2013. El Chigüire Literario will continue publishing articles and tutorials in Spanish. My site, www.ciroduran.com, will have articles in both languages. It is necesary that you developers stand out with your work, and keep talking between you. At some moment several of you made to yourselves the same question: “am I the only videogame developer in Venezuela?”. I think that’s a stage you have already overcomed, and the next question should be: “what can we do together?”. I have seen the results from the game jam, and other initiatives I’ve seen around. From this side of the screen, I offer all the support you need to spread your work. Thank you for reading me, following me, and supporting me. I hope you still do it. When the Global Game Jam did its first call in 2008, I really had no idea if it was possible to host a game jam in Caracas. I knew the concept of a game jam through TIGSource, but I didn’t know what did it take to do it, or if I even had the tools to do it. It was thanks to Yole, my wife, and the collaboration of many people, including participants, during 5 years, that the Caracas Game Jam has become the success it is now, creating a community of game developers that surprises many people, even us. 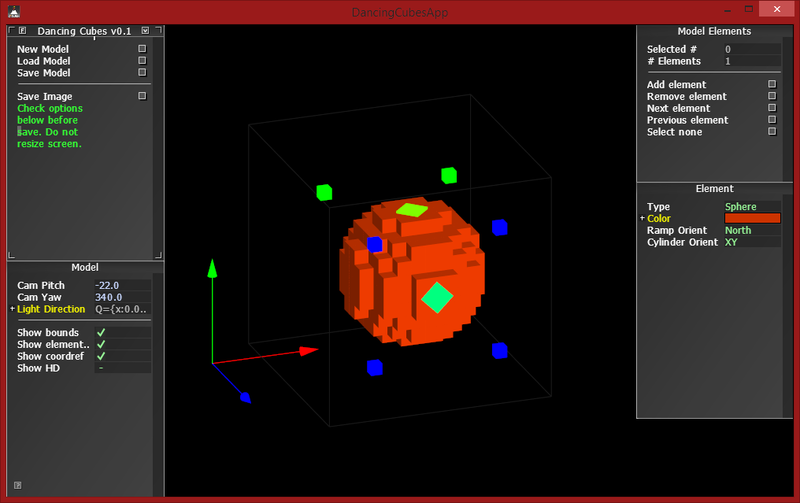 At the same time, I have also been involving myself more into the Global Game Jam. 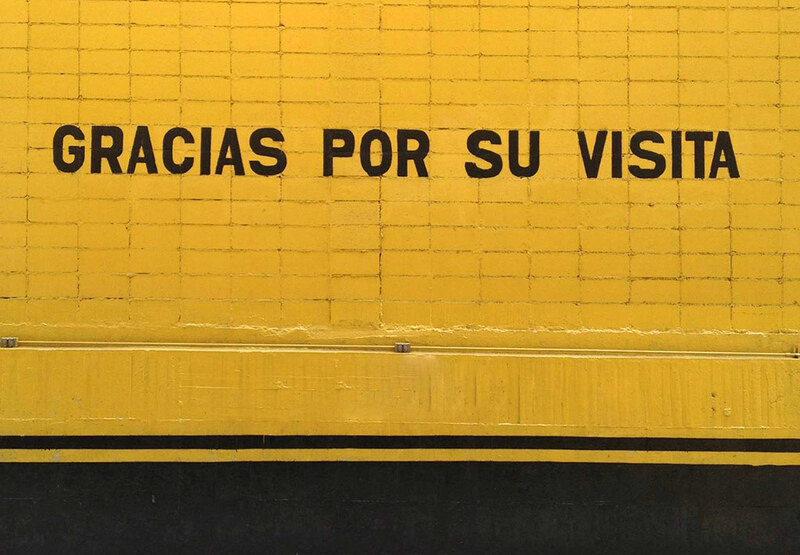 It excites me that the GGJ is an event organized by lots of volunteers from all parts of the world, and that’s why I collaborated last year with the organizers to coordinate Spanish-speaking locations in Latin America. It was a very enriching experience, where I talked to lots of people that, like me, also want to host a game jam in their city, and have their own motivations and ideas to propose. Having said that, this year the event organizers have extended the invitation for me to be part of the Global Game Jam 2014 Executive Committee. The Executive Commitee is in charge of running the event, from coordinating locations to decide the theme, including the website maintenance and the search for sponsors for the global event. This is a voluntary position that I gladly accepted and I hope to collaborate with the participating locations from this corner of the world. We have done several meetings since some weeks ago, and I can tell you there are marvelous things coming to the event. The work has already started, and by September we will make the call for new locations sign-up. Due to the position I’m taking, the organization of the Caracas Game Jam won’t be completely on me and Yole, but by collaborators that have worked long-time in the event, and in which I have complete trust in their good work. I will bring you news about the Caracas Game Jam very soon.